Investors frequently ask what returns can be expected from investing with GROUNDFLOOR. The answer to that largely depends on the allocation decisions investors make. For example, we’ve noticed that some of our investors choose to concentrate in the highest-yielding loans (grades C or lower). Others allocate more to loans at the lower end of the risk scale (grades A and B). With over 127 loans repaid and over $11 million in principal returned to date, we now have ample data to analyze and answer the question empirically. We recently performed an analysis to quantify the effect of diversification on GROUNDFLOOR returns. The analysis is based on data for over 2,400 individual portfolios reflecting the allocation decisions made by our investors over time. The results are colored by two loans that realized losses (4626 Brooks St and 174 Timothy Drive), eleven high risk loans that successfully returned full principal and interest with yields of over 18% and a handful that repaid penalty or other interest in excess of the contracted rate. As many readers know, diversification is a risk management technique that mixes a wide variety of investments within a portfolio. When properly diversified, a portfolio should yield higher returns and lower risk more reliably than will a single investment or small number of concentrated investments held in a similar portfolio. Diversification is a strategy intended to negate risk events that are unique to any particular investment in a portfolio. With diversification, the negative performance of some investments is expected to be countered by the positive performance of others. 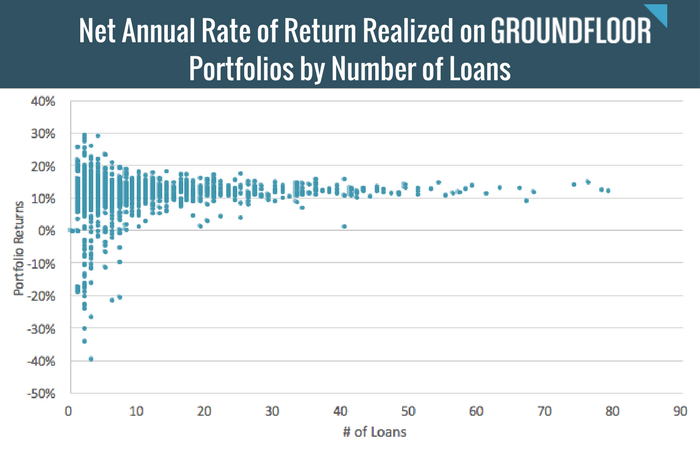 This chart shows the relationship between portfolio returns realized and the number of loans held in each portfolio. Each dot represents a portfolio containing a number of loans (plotted along the x-axis) and having realized a given annual rate of return (plotted along the y-axis). For reference, our analysis shows that a hypothetical model portfolio composed of an equal investment made in all 127 loans repaid to date would've earned an annualized return of 12.36%. We calculate portfolio returns by dividing the amount of interest earned for each investment by the amount of principal invested, and then annualizing that figure. Each annualized return is then weighted by the amount invested as a proportion of all principal invested in the portfolio. Reinvestments are accounted for as new, separate investments. Balances held as available cash in GROUNDFLOOR Accounts are not included in the analysis, since they are not invested and can be withdrawn upon demand. As the theory of diversification predicts, portfolios invested in the largest number of loans realized the most reliable returns. This is true even though GROUNDFLOOR investors decide not only which loans to include in their portfolios, but how much capital to allocate to each loan, relative to the others. The power of diversification is that strong. This chart also shows the risk of not diversifying one’s investments. A small number of portfolios at the extremes put all their eggs in one or two baskets. Portfolios containing only a handful of loans or less realized a wide variety of returns, including some significant losses for those who bet big on our one high-yield (23.8%) F-grade loan that lost principal. The “loss ratio” is the amount of principal lost expressed as a ratio to the principal invested. A loss ratio of -0.05, for example, would mean that $50 was lost out of every $1,000 invested. 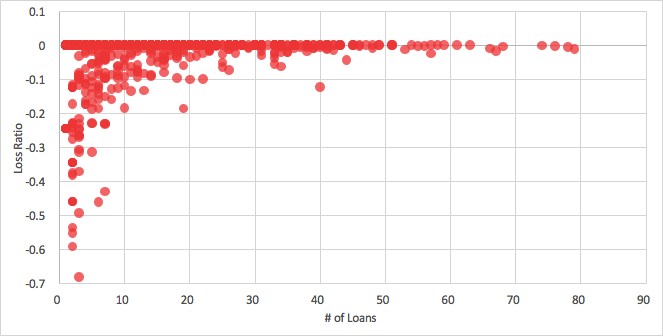 Similar to the rate of return chart, the chart above illustrates loss ratios realized by individual portfolios compared by the number of loans held in each portfolio. A model portfolio composed of equal investments in all 127 repaid loans repaid to date would've experienced a loss ratio of -0.0074. Any given ratio may be acceptable to an investor if the returns realized in relation to the risk are high enough to offset the losses. For example, the vast majority of investors with more than 20 loans experienced loss ratios of -0.05 or less. Looking at the previous chart, those investors also earned returns high enough to keep overall net returns in strongly positive territory (generally over 10% -- after subtracting losses). A handful of portfolios experienced losses significant enough to reduce their returns to less than 5% -- because they either bet big on a loan that realized a loss, or allocated heavily to lower-yielding, safer loans that did not adequately offset their losses in other loans. Again, for investors who didn’t diversify, loss ratios were higher on average and their net returns lower. The model portfolio described above earned net returns of 12.36%, after accounting for losses of 0.74%. 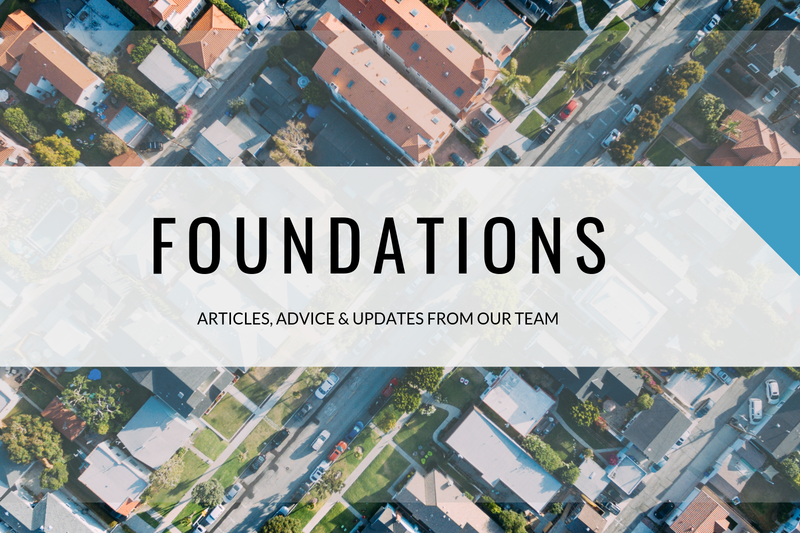 GROUNDFLOOR encourages diversification and believes sharing this kind of information will help to ensure our investors’ success. If you have any questions or comments about this report, do not hesitate to reach out to us. You can comment below, tweet to @groundfloor_us or send an email to support@groundfloor.us.